CEO Mually said that a potential so-called "value B" model would be the same size as the Fiesta but cost less. 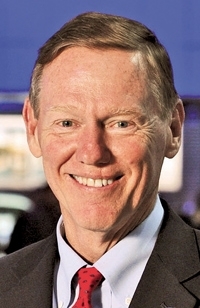 AMSTERDAM -- Ford Motor Co. CEO Alan Mulally says the automaker is considering adding a low-cost Fiesta-based subcompact to sell globally but is not planning a stand-alone low-cost brand like Renault's Dacia. "We are looking around the world at opportunities to offer a car priced below the Fiesta," Mulally told Automotive News Europe on the sidelines of a company event on Sept. 6. The CEO said that the so-called "value B" model would be the same size as the Fiesta but cost less than Ford's top-selling model in Europe. Mulally declined to say where the low-cost subcompact could be built and sold, if it is produced. "We do not have a firm plan at the moment [for a global sub-B model], but clearly being competitive in every market segment is important," Mulally said. He added that costs for any low-cost Ford would be kept down by using a global architecture and sourcing parts worldwide. Despite its interest in making a low-cost B-segment car, Mulally said Ford is not planning to create a separate brand to rival Dacia. "The eventual model will bear the Blue Oval," he said. Since its 2004 debut, Renault's Romanian subsidiary has been growing steadily from one model, the Logan sedan, to a lineup that includes a hatchback, wagon, minivan and small SUV. The automaker expects to sell about 1 million low-cost Renault and Dacia models around the world this year, up from 813,000 last year. The entry range has also delivered Renault a profit margin of 9 percent, analysts estimate. Also interested in gaining a piece of the low-cost niche, French rival PSA/Peugeot-Citroen will debut low-cost Peugeot and Citroen models at the Paris auto show this month.